Ithala Game Reserve is situated near Louwsberg in northern KwaZulu-Natal, South Africa, rolling down from the Ngotshe Mountains into a deep river valley characterised by incredibly ancient rock formations. Ithala Game Reserve is an easy 5 hour drive from Johannesburg and a 4 hour drive from Durban. The roads to Ithala are tarred all the way. The nearest town is Louwsburg in northern KwaZulu-Natal, South Africa. Ithala boasts a wide and diverse range of habitats and landscapes, characterized by deep filled valleys and gorges, clear streams cascading over bellowing waterfalls into deep pools, and expansive grasslands. These grassy plateaus at this KwaZulu-Natal game reserve in South Africa are home to a wealth of plains game such as Blue Wildebeest, Tsessebe and Red Hartebeest. Ithala’s big game species include White and Black Rhino, Elephant, Buffalo and numerous Giraffe. The absence of lion makes for a relaxed atmosphere, where these animals and other game such as Zebra, Blue Wildebeest and a wide variety of antelope graze peacefully. Seldom seen predators at this KwaZulu-Natal game reserve in South Africa include Leopard, Spotted Hyena and Brown Hyena. After years of near extinction from this area, Redbilled Oxpeckers were reintroduced to the reserve and these birds can now be spotted at Ithala. From Durban it is best to travel via Eshowe and Melmoth to Vryheid. From Gauteng, the best approach is via Standerton, Volksrust and Utrecht to Vryheid. From the north coast, guests can travel via Pongola and Magudu. From Pietermaritzburg, travel is best via Ladysmith, Dundee and Vryheid. Ithala has a airstrip that can be used - details and required procedures on request. This airstrip at Ithala Game Reserve is suitable for light, medium and heavy twin engine aircraft up to a DC3. There is sufficient parking for 3 medium twin engine aircraft or 5 single aircraft. Possible hazards include occasional strong side winds and wild animals on the strip, despite the cable fence. Pilots are asked to check carefully before landing. The airstrip is not registered. 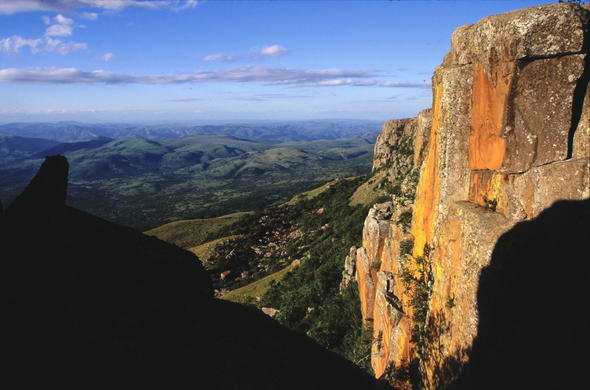 Ithala Nature Reserve is located in KwaZulu-Natal, South Africa. It is tumbling from the heights of the Ngotshe Mountains and surrounded by various indigenous flora and fauna species. The scenic beauty aside, Ithala National Park's most characteristic feature is perhaps its astonishing geological diversity. Some of the oldest rock formations in the world are found here, dating back 3 000 million years.